Progress Days is pleased to have a carnival returning to the grounds! Badgerland Carnival will be offering wristbands prior to the event. Please watch for more information. 1. Pies must be homemade with crusts and fillings made from scratch. No store bought crust, dough, or canned fillings maybe be used. Each pie must contain at least a bottom crust. 2. The pie must be entered by the person who made it. 3. It is strongly recommended that pies are baked in disposable pans, as pans will not be returned. 4. Refrigeration is not available, therefore, no pies that require refrigeration will be accepted. 5. Baker must bring two (2) identical pies. Pies must be checked in by I:30 pm on contest day. If recipe contains nuts, please notify staff when dropping off pies for appropriate labeling. 6. Following judging, the pies will be sold to attendees, by the slice or whole pies. All proceeds will go to Bristol Progress Days Inc. The top 3 placing pies will be sold at the auction on Sunday. 7. A copy of the recipe would be appreciated with submittal of the registration but not required. Recipes may be made public after contest. 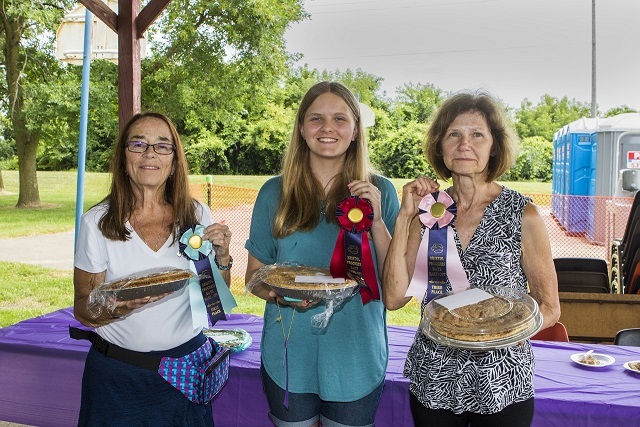 If you wish to bake a: pie and not have it judged, we will be happy to accept it and sell it to raise funds for Bristol Progress Days Inc.
NO LIMIT ON THE NUMBER OF PIES YOU MAY ENTER. PRE-REGISTRATION IS STRONGLY ENCOURAGED SO WE MAY HAVE THE CORRECT AMOUNT OF TABLES READY. Each judge will assign a numerical value 1-10 in each criteria category. Pie receiving the highest total value is the winner. Judges will not know contestant names until judging is complete. Winners will be announced after judging is complete. Registration must be received by July 5th .